The Watson Pro 14.4V 158Wh Slim Li-Ion Battery, in a Gold mount, provides up to a 12A draw, enough to power the most demanding cameras, lights, and studio setups. It also features a 12V, 10A D-Tap output for powering monitors, transmitters, and other gear and accessories simultaneously with your main load. The 158Wh capacity provides approximately 4 hours of runtime for a load of 35W. A 5-LED gauge on the side indicates remaining battery life at the press of a button below the LEDs. When capacity drops under 9%, the bottom LED automatically begins blinking as a warning. For safety, built-in intelligent circuitry shuts down the battery in case of high current, low voltage, extreme temperatures, or possible short circuits, protecting both your battery and gear. All this is offered in a relatively slim design with ergonomic grips on the sides that allow for more comfortable handling. 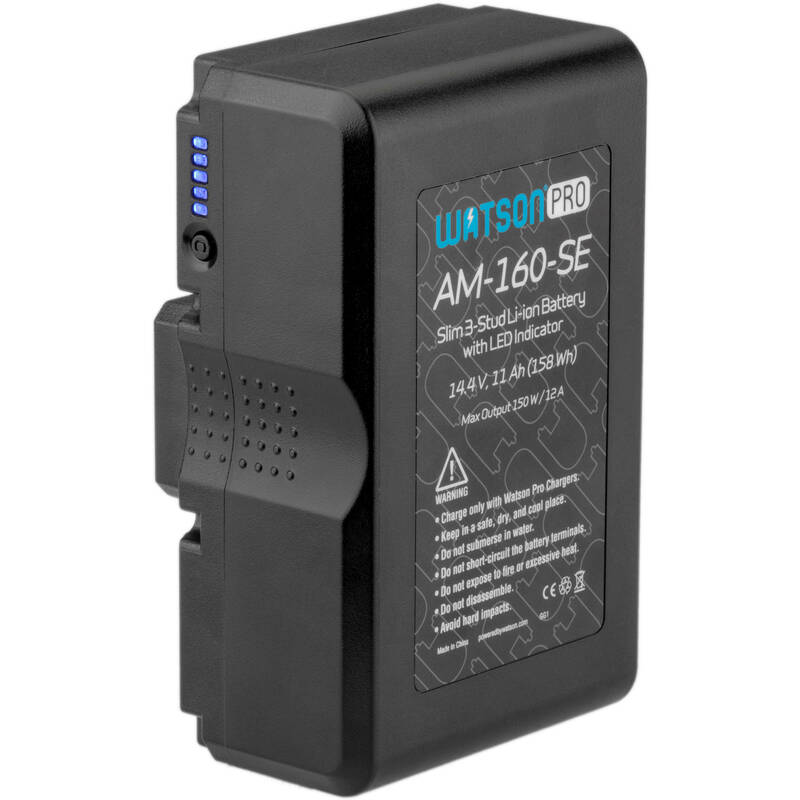 The AM-160-SE is rechargeable using any Watson Pro Gold mount charger. Box Dimensions (LxWxH) 7.55 x 4.8 x 3.45"